Sacroiliac sciatica is one of the less common symptomatic syndromes associated with specific SI joint disorders. Sciatica is actually not the proper term for these syndromes, as this term implies a spinal nerve root origin of buttocks, leg and foot symptoms. The actual name that should be utilized is sacroiliac pseudo-sciatica, since the condition mimics true spinally-motivated sciatica in every way, but is triggered by a source that exists outside of the spinal nerve roots in the lower back. However, during this article, we will use the terms sciatica and pseudo-sciatica interchangeably for the sake of simplicity. Pseudo-sciatica is a very common painful symptom set that can come from a staggeringly diverse catalog of potential causations. Of all symptoms, sciatica is one of the hardest to accurately diagnose and effectively treat. Therefore, sciatica is one of the symptom sets that receives laser-focused attention on the sites of The Cure Back Pain Network and in this essay will be the subject of detailed investigation. This narrative explores the relationship between particular sacroiliac joint disorders and the expression of sciatica pain syndromes. 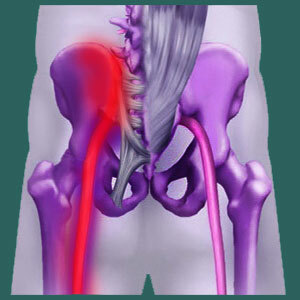 We will explain what sciatica is and why it may occur in conjunction with SIJ diagnoses. 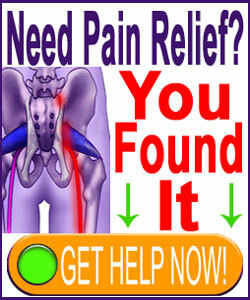 Finally, we will also detail alternative explanations of pseudo-sciatica in association with sacroiliac joint pain. Pseudo-sciatica describes buttocks, leg and/or foot pain that is not caused by compression of one or more lumbar nerve roots. Symptoms can exist in one or more areas of the lower body and often move about randomly or in set patterns. In addition to pain, most patients will also experience a variety of neurological expressions including tingling, numbness, weakness and even functional deficits, such as foot drop. Sciatica might also include more sinister symptoms in rare cases, including sexual dysfunction, incontinence and the inability to stand. The clinical severity of these symptoms is not always indicative of the severity of their causation, as we will discuss in the final section of this essay. For the purposes of this article, sacroiliac-enacted symptoms are created through some mechanisms of interaction with the various components of the SI joint. Since the sciatic nerve passes between some ligamentous tissues, the blame for possible compression of this largest anatomical nerve typically falls on a soft tissue impingement pathology. The most commonly seen structural reason for pseudo-sciatica caused by a tissue within the SI joint occurs when the sacrospinous ligament constricts the sciatic nerve as it passes through the region of the joint on its path down each leg. This ligament defines the opening through which the sciatic nerve passes through and can clamp down on the nerve for various reasons, including injury, hypomobility or muscle imbalance. However, many other pseudo-sciatica expressions are possible that do not directly involve the sciatic nerve or any compression syndrome. Remember that pseudo-sciatica can exist in one or more areas of the buttocks, upper legs or feet. Remember also that normal sacroiliac symptom sets often include direct or radiating pain in the buttocks, hips and even upper legs. Referred pain is also possible in these regions, as well as in the feet. Therefore, even direct sources of SIJ discomfort can mimic sciatica in definitive ways and may cause even more confusion when it comes to diagnostic evaluation. Lumbar spinal pathologies can enact true sciatica. These range in scope from herniated discs to spinal stenosis to foraminal stenosis to all manner of atypical and problematic spinal curvature and misalignments, such as scoliosis, hyperlordosis, hypolordosis and spondylolisthesis. Cervical spinal stenosis can also create symptom sets that mirror sciatica and are often overlooked in favor of more common lumbar pathologies. Piriformis syndrome can compress the sciatic nerve due to injury, muscle imbalance or ischemia due to structural or mindbody-enacted mechanisms. Diabetes can cause sciatica, as can other disease processes. Psychogenic causation is a major source of sciatica symptoms sets, with oxygen deprivation being the leading mechanisms of action. This ischemia can act on the lumbar nerve roots directly, on the fully formed sciatic nerve directly, or on any of the many soft tissues that have the potential to compress the sciatic nerve if the tissue goes into spasm. Learn more about the relationship between sciatica and the sacroiliac joint on our excellent resource, Sciatica-Pain.Org.